The vast amount of attractions in the USA is limitless. But if allowed only to choose one of the 50 states to explore at my leisure, I would not hesitate to select Arizona first and foremost. 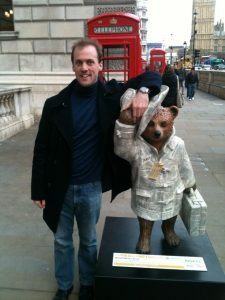 Many travel writers and bloggers refer to having a special love for particular places, and for personal reasons. Places that changed them and gave a new sense of perspective. Places where dreams came true. Or just where you “found yourself”. I, for one, could say that as a teen Arizona was where I seemed to find myself. Immortalized in countless westerns, road movies or even music videos, driving through almost never-ending roads of red rocks and cacti and bright blue skies felt like an escape. Whether as the driver or a passenger, I felt like I was in my own movie. And the sorts of movies I loved to watch, now it was as though I was as close as I could be towards making one! Back in the summer of 1998, in the midst of personal teen angst, the Grand Canyon State would lift my mood without doubt. The state’s most famous landmark – the Grand Canyon – may be the summit of many people’s bucket list and no trip to Arizona is ever complete without visiting of course! But there is so much more, and here are ten reasons why the Grand Canyon State has to be my favorite of all the United States of America. Yes, the grandest one of all is here and you can’t fault the crowds that come here. But further to the north-east close to the Utah border is Glen Canyon National Recreational Area and the interconnecting Lake Powell reservoir. Coming about as a creation of a dam, this is one of the best areas for recreation as well as exploration. The option for fast paced jet-skiing or wake-boarding is there. But also, taking a more gentle paced boat tour is the best way to really appreciate the geology. Going right under the natural arch of the Rainbow Bridge – an absolute essential! 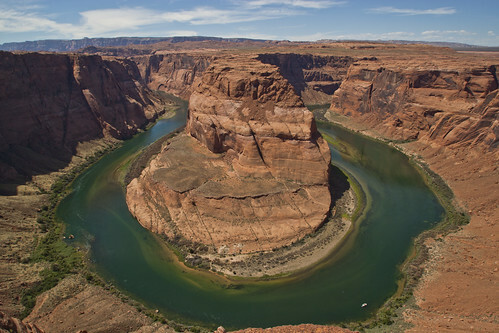 And another one of the state’s most photographed sites is located here – the Horseshoe Bend. From afar, the river curves round a rock giving what looks like a U-shape from above. Hence the nickname. Canyon de Chelly (pronounced “shay”) is a sacred spot located in the northeast near Monument Valley. Of great significance to the Navajo people, the “Spider Rock” is what sticks out among the rocks. Another great example of the “spiritual” feeling abound in Arizona (more on that later), exploring the ruins of an ancient pueblo dwelling inside the rocks. A visit to Oak Creek Canyon is perhaps the best alternative to the Grand Canyon if crowds are too much! Unofficially regarded as its smaller cousin, this grand canyon with pine trees is a great hiking location. Located in the Coconino National Forest, the all year round nature trails and scenery are just a perfect “get away from it all” break. And with less crowds, definitely the perfect place for “me time” and self discovery. It is so tempting to just drive through Arizona spontaneously without any final destination in mind. At every turn is a wonder of geology that stretches back to a time unknown. 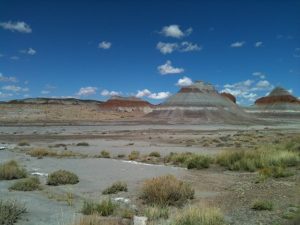 The Painted Desert and The Petrified Forest are located in close proximity in the Navajo area to the east of the state. Characterized by rocks of flame red limestone, this area was where I really looked around and wondered how far back the fossils date. A paleontologists heaven, you could spend days marveling at the remnants of the Late Triassic period here. The bright red teepees of the Petrified Forest. Then further near Flagstaff is the Meteor Crater, which looks like a giant pit. Supposedly a giant meteor struck millions of years ago. Or was it a geological evolution? Like with many of the natural wonders, nobody knows the exact answer of how it came to be. Closer to Phoenix, the Hole-in-the-Rock, a natural rock with a big hole in has to also be one of the best viewpoint locations in the whole of Arizona. Whether in daylight or at dusk, it makes for a special trip to hike up here and view the downtown from one side and the cacti from the other. Going inside Antelope Canyon, this picture postcard perfect example of a slot canyon is amazing in the pictures but actually going inside feels mystical. Likewise, as mentioned earlier, the Horseshoe Bend and Rainbow Arch at Lake Powell – well, the photo opportunities are endless! The image of the green, spiky cacti is almost the symbol of Arizona. Many are in different shapes and sizes, from prickly pears to fig leaves but there is one that stands tall and proud in the desert – the Saguaro. Mostly located in the Sonoran Desert near the southern city of Tucson, the surrounding area makes for a national park in itself. The Saguaro National Park is a region dedicated to the protection of this special cactus but also the flora and fauna that surround it. 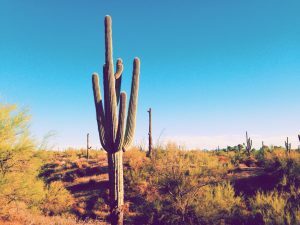 The Saguaro cactus – a special symbol of the state of Arizona. Just as significant to Arizona and most of Mexico as well is the organ pipe cactus. So called for its resemblance to a pipe organ (although personally I think it looks more like a claw), this is another species of cactus prominent in the south of the state. And like the Saguaro, it has its own dedicated area of protection The Organ Pipe Cactus Monument. Just outside Phoenix is the exceptional Desert Botanical Garden. An absolute must visit to admire the dedicated preservation and conservation. The gardens have five specially themed trails where you can get a feel for desert plants of not only the American Southwest but other regions of the world too. The state’s main city and its interconnected city suburbs each have their own character. The ever upmarket Scottsdale is blessed with first class golf courses and other quasi-Beverly Hills trappings. More so, its Old Town is very charming and the place for great souvenirs. 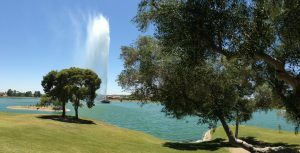 The Fountain Hills area of Scottsdale is absolutely perfect to chill out! 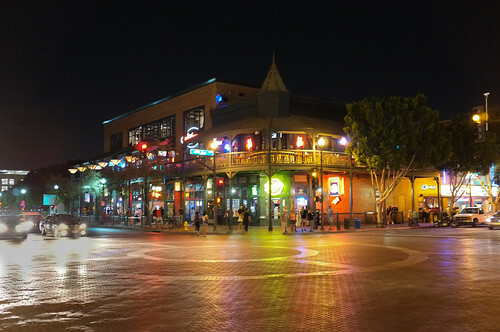 Tempe, being the location of Arizona State University, is inevitably where the great nightlife is at. Mill Avenue is the center of all action in the daytime and night. Inevitably has that party atmosphere and youthful energetic pulse, so if you want a good time or to feel like you are reliving your student days Van Wilder style, this is the perfect place! Phoenix itself is well equipped with the right mix of arts and culture suited to a big city. One of the most quirky and unique attractions is the recently established Museum of Musical Instruments. Instruments traditional to specific parts of the world have their own dedicated sections and as with any great museum, visitors of all ages can have fun with an interactive exhibit. A Natural History Museum, Science Center and Phoenix Zoo are some great places for an educational and inspiring day out. In the area of Mesa, the Heard Museum is one of the most significant museums of ancient Navajo arts and crafts of very special significance to Arizona. The juxtaposition of a buzzing, modern city with the desert surrounding it is such a perfect mix. A hiking excursion of Camelback Mountain or climbing the Hole-in-the-Rock, just two examples of great adventure in such close proximity. Arizona of course is always associated with the legends of the Old West. Not only is this evident driving through Monument Valley but a town like Tombstone felt like going back in time. 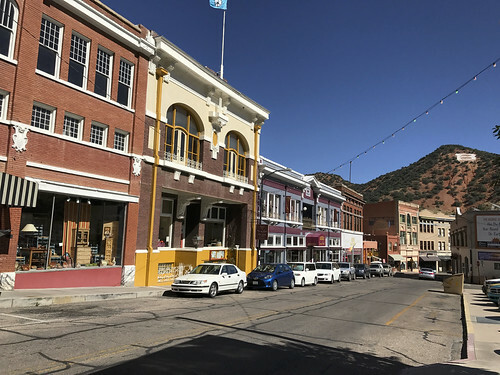 One of the most famous towns of the Old West, it was of course the scene of the Gunfight at the OK Corral – the duel between Doc Holliday, Wyatt Earp and his brothers against the Clantons. Gunfight re-enactments and Wyatt Earp dress-ups for tourists are of course commonplace, but take a walk through the actual town. With horseback the only method of transportation and saloon bars aplenty, it really feels like being in a movie. What is best about Tombstone is that never did it feel “kitschy” as is often the criticism of anywhere that almost accurately resembles the past. And if in Tombstone, you got to pop in to “Big Nose Kate’s Saloon”. Live music and whisky – the Old West experience couldn’t be more authentic. And apparently, the place is haunted too! Old Tucson Studios nearby has to be one of the best artificial western towns you will find. 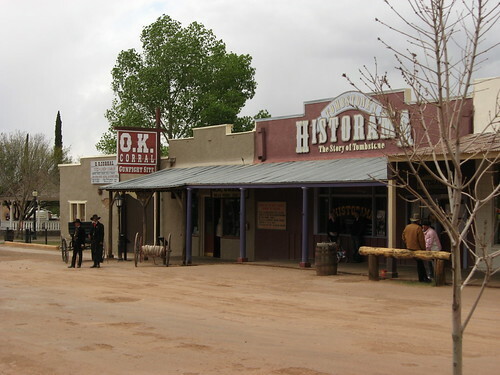 A filming location for numerous westerns (particularly of course the 1957 Gunfight at the OK Corral movie and 1993’s Tombstone that tell all about that eventful Wednesday afternoon in 1881), but now very much a recreated “living museum” that gives the feel of a Wild West town. And complete with characters in costume and mock gunfight re-enactments, another place for western fans to get their kicks! With almost year-round sunshine it comes as no surprise that, Arizona has got to be the best place for us outdoors-y types. Scottsdale in particular has not shortage of golf courses, the opportunity to try out horse riding especially in the heart of cowboy country cannot go amiss either. 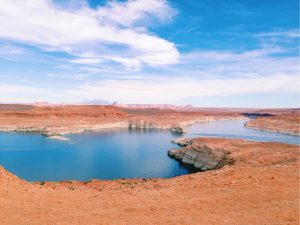 The vastness of Lake Powell and the surrounding Colorado River are a perfect location for all kinds of watersports, whether fast paced jet-skiing or just a gentle leisurely sail. Lake Powell in the north of Arizona is one of the best places for watersports! And the great all-American pastime that is baseball, the Spring Training season between mid-February and mid-April is one of the most popular times to visit. Sounds crazy that a mere practice session for the big Major League teams should be such a big deal, but many big name teams come down here for practice. As practicing in sub-zero temperatures of the Midwest is not at all practical in the slightest, you cannot blame many teams for choosing Arizona as an ideal sunshine location. Numerous ballparks across the Phoenix area attract hundreds of devotees to the game. The millenia-old rocks and the sacred Navajo culture in Arizona carry a spiritual feeling when here. 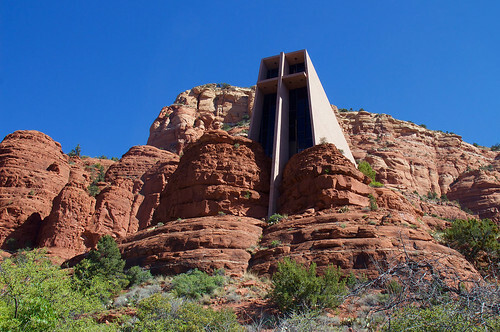 Sedona is very much the spiritual heartland of not just Arizona, but maybe the USA overall. A very popular new age hotspot of wellness and yoga retreats that attracts many to come here and “find ourselves”. It is believed that here is where the spiritual vortices are located. Tracing back to Native American legend, there was a belief that this was a location for spiritual renewal. Whether or not you truly believe in the spiritual side of things is down to you. However, there is no doubt that the Navajo region provides a sense of calm and peace. Being surrounded by the red rocks, there was something in the air. Something that soothed me of all my worries. Maybe it is just the mere wonder of the area and its serene isolation from the fast paced world that in itself was enough to find my inner tranquility. Driving through the Navajo Nation in the northeast, I could not help but feel a sense of personal calm. Whether in Monument Valley, or any location with a sacred significance, whatever worries I had lingering were relinquished. The road that approaches Monument Valley, the photos are not enough to do it justice. When on a road trip to this part of the States, stopping off for a short pause is only natural. Inevitably, it seems almost a given that you may feel the urge to pull over in a random abandoned looking settlement. Completely forgotten by others, it can feel depressing. Boarded up houses, disused cars, and not a trace of civilization in sight save for a population of about two or three. It makes you wonder how anyone can live there! But some exceptions like Bisbee made an impression. This former mining town was buzzing until the mines closed down in the 1950s. The population disappeared, leaving it looking like a true ghost town. But, recent decades have seen a bit of a renaissance story. Attracted by cheap rents, it became a perfect place for artists and creative types to move in. Almost giving the place a new lease of life. Add to that a fully functioning tour of the old mines and even a ghost tour of the supposedly haunted saloons, this is what I call a great story of rebuilding for the future but loyally preserving the past. A ghost town rejuvenated, hope for all ghost towns out there? I’ve already alluded to it but cliches aside, when you are driving along some of America’s most scenic highways you almost take it for granted. Rocks that come in fiery colours and irregular shapes. The cacti that almost seem like a decoration. The quirky towns each with their own story to tell. The movie locations that get people like me all excited. Forests of pine to the north. America was made for the road and Arizona is hands down the proof. But one thing I will never forget is the importance of this location to the indigenous peoples. I remember one evening we went to the Navajo Nation Museum and watched a very thoughtful short film. The narrator explained all about how special and sacred the land around us is to his people. How sacred the earth is. And at the film’s conclusion set to the sight of dusk over Monument Valley, in his words saying how the Earth will live on, long after we’ve gone. A sobering and emotional conclusion and a reminder to just look after our planet. 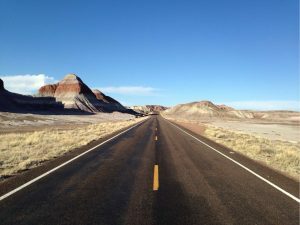 Furthermore, if you are going on a longer road trip and are furthering your adventures, Arizona happens to be very well connected to other Interstate highways taking you elsewhere. The I-10 due west of Phoenix into Los Angeles and California. The 93 to Vegas and then on the I-15 into Utah and further north to the Rockies. Keep going a few days and you’ll be close to Canada! The I-10 eastwards through Texas all the way to Florida. Other easily inter-connectable routes to other highways. The ease of it all, there is no better base for your great American Road Trip! Furthermore, for heading south into Mexico, if you don’t fancy driving then Phoenix Sky Harbor Airport operates regular flights to Mexico City, Cancun and Guadalajara at reasonable prices. Have you ever been to Arizona before? What were the things that made your trip most special? I have always said that the area around those two States is the classic America!